Give his man cave some extra flair and a personalized touch when you display this street sign on the wall. Friends and family will immediately know who has control of that space upon seeing this sleek and one of a kind decor in his special room. This Personalized Metal Street Sign measures 5”x 20” and includes holes for easy wall mounting. This sturdy metal sign looks great hung above any entryway or outside your home. Free Personalization of any name is included. 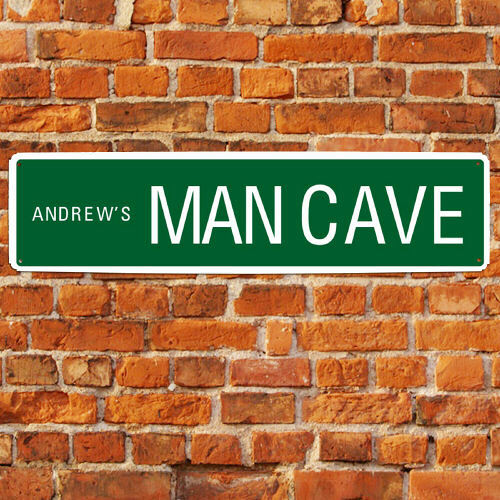 Additional Details Give this street sign as a personalized gift to your man for his "man cave" area in your home. He'll appreciate receiving a gift that will really mark that area as his territory. Our Personalized Grand Slam Saloon Metal Wall Sign would be a great sign option for baseball fans.